Due to high sea levels, APO is changing our annual summer BBQ this year. We will have everything but the grill, and adding in a few more bonuses. 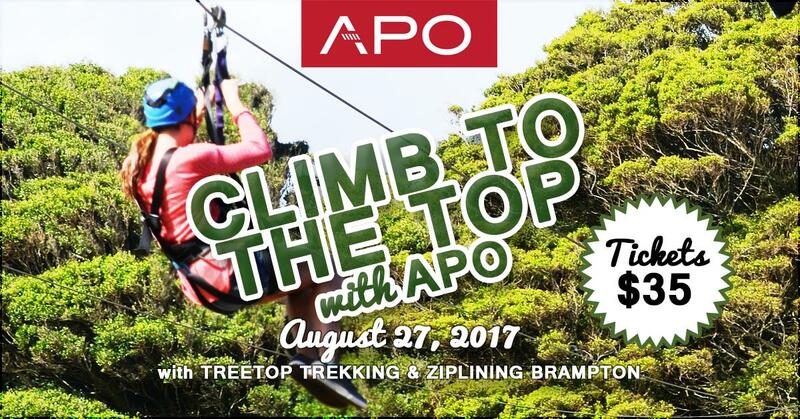 Join APO as we go to Treetop Trekking & Ziplining Brampton! This summer social event will help develop your team work skills, challenge your problem solving skills and push your strengths to the next level! For only $35, you will trek from tree to tree on fun games like suspended bridges, Tarzan swings, swinging logs, cable traverses and of course zip lines! You have 3 hours to complete the courses! The regular admission rate at Treetop Trekking is $59.99 per person but if you go with us you only pay $35!!!! Purchase your ticket on Eventbrite today: https://www.eventbrite.ca/e/climb-to-the-top-with-apo-tickets-36734462767 ! You will also get a chance to really connect with other APO members through engaging icebreakers and team building competitions. And of course we will be serving lunch and snacks (included in the ticket price) to keep you going while you climb to the top with APO. We hope that you welcome this change and join us in developing our Afghan professional network to different heights. Spots are very limited for this event due to the nature of activities and bookings. Please RSVP as soon as you can so we can ensure you a spot. We will not be selling tickets on the day of or at the door. *Please note that the aeriel climbing courses range from beginner to advanced so there is fun to be had for just about everyone. ** Each ticket gets you entry into park, team building exercises, and 3 hours of tree top trekking and ziplining. Lunch, snacks and beverages are included in ticket pricing. APO will be selling tickets at a very special APO Rate for only $35. Please meet us in the parking lot at 12pm for registration.